Are you tired of nicking your face when shaving? Using a razor to remove unwanted hair from the face and body can be both painful and time-consuming. With laser hair removal, you can now reduce unwanted hair and get lasting results. We use advanced laser technology to deliver results without causing painful side effects. Stop wasting time shaving your face and get a clean-shaven look that lasts! How does Men's Hair Reduction Work? Unlike shaving or waxing, powerful laser beams target individual hair follicles below the surface of the skin. The gentle pulses of laser energy destroy the hair follicles and prevent hair from growing back. Approximately four to six sessions are needed to treat all of the follicles and permanently reduce unwanted hair. Laser hair removal treatments can effectively remove hair on the chest, back, arms, legs, and face without harming the surrounding skin. The size of the treatment area and the patient’s hair type will determine exactly how many sessions will be needed to achieve permanent hair reduction. Laser hair reduction sessions are short and the side effects are no worse than the redness, itching, and cuts that can occur from shaving or waxing. Most patients can resume their normal activities immediately following laser hair removal. 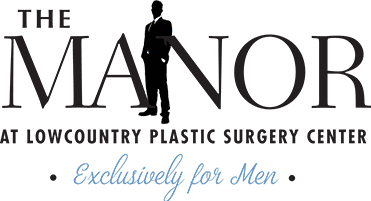 To schedule an appointment, please contact The Manor at Lowcountry Plastic Surgery Center and get ready to say goodbye to unwanted hair!